Jenny’s father arranged a marriage for her, and made sure that she could not say no. She had never dreamt of disobeying her beloved father’s wishes, but an arranged marriage was too cruel a theft of her dream. Left with no choice, she would betray her true love, and he would never know why. 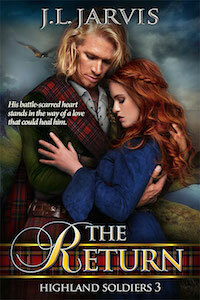 Now home, the sight of Jenny in another man’s arms rouses a fury in Duncan he has never known, even in battle. Forced to face the woman who betrayed him, he fights to hold back the pain that sears his scorned heart. As Jenny struggles to honor her duty to family, she cannot deny her heart’s longing. Driven by love, Jenny takes a stand to win Duncan back. But their passion will come at a terrible cost. Book 2 in the Highland Soldiers series, Scottish historical romances set during the turbulent Covenanter times of seventeenth century Scotland.